RORATE CÆLI: Event: Sung TLM in Church of Saint Joseph, Yonkers, NY. Event: Sung TLM in Church of Saint Joseph, Yonkers, NY. 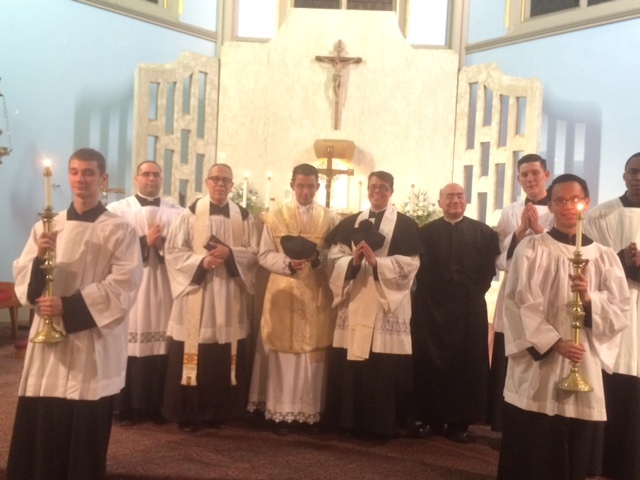 May 20, 2015 - first TLM in St. Joseph, Yonkers in 50 years. Encouraged by the numerous attendance of the first Extraordinary Form Mass at our parish in almost 50 years this past May 20th and due to requests from parishioners, we invite you to another splendid Missa Cantata at our church on Friday, July 24th at 7 p.m. The Missa Cantata will be offered as a Votive Mass of the Precious Blood, given the traditional theme of July. Animados por la concurrencia numerosa de la primera Misa de Forma Extraordinaria en 50 años (20 de mayo), les invitamos a otra bellisima "Missa Cantata" del viernes, 24 de julio a las 19h en el templo. Se ofrecera' la Missa Cantata como una Misa Votiva de la Sangre Preciosa, puesto que es la devocion de julio. This is the second-oldest parish in Yonkers, having been founded in 1871. At present it is home to a large and active Spanish-speaking community, which also explains the value of this Traditional Latin Mass: as a further example of TLM outreach to Hispanics, who are all too often wrongly stereotyped as even less interested in this Mass than "Anglos", this Mass that had converted the entire Southern and Central Americas to the Catholic Faith! Of added interest is the parish's budding sacred music program, which is described on its Facebook page (see this and this).